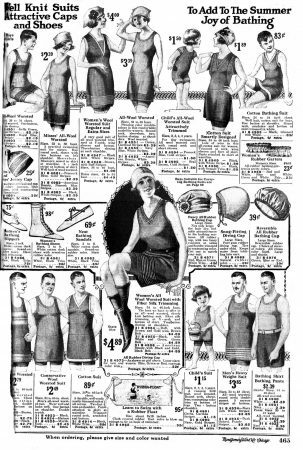 The start of the roaring ’20s’ and swimsuits were still modest – for the men as well as women. Although not quite as fully covering as swimwear from a decade before (arms and legs are starting to show) they still cover more than they reveal. Look at the “hero” outfit in the center of the page – lace-up shoes, shorts, skirt, belt, and cap all get involved somehow. Not something you’d want to swim laps in. Especially as it’s made of wool. Wool…like a wet sweater. Wouldn’t such swimsuits tend to drag you under? With all the magical stretchy synthetic fabrics available these days, it’s hard to imagine what swimming in wool would have been like. The other surprise here is about color. 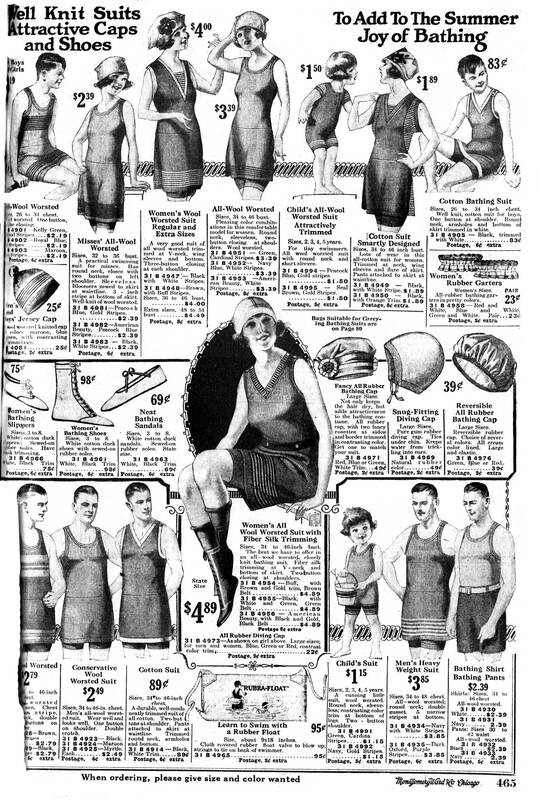 I guess, having seen only black & white movies and photos from the era (and black & white catalog pages like this) in my mind’s eye all old bathing suits were black or grey. But zoom into the page and check out the copy. This swimwear came in a wide range of colors: Peacock Blue with Gold Stripes, Green with Cardinal Stripes, Buff with Brown and Gold Trim, Maroon, and a mysterious “American Beauty” with white stripes. So at least as regards color, perhaps the 1920s were, in fact, beginning to roar. Previous Previous post: Scouts…or Stews?